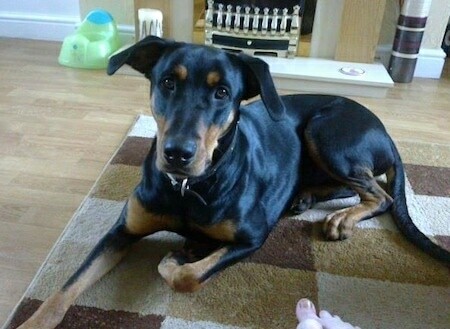 "This is Suzie the Doberman / Rottweiler mix breed at 3 years old. Her mom was a Rottweiler and her dad a Doberman." The Rotterman is not a purebred dog. It is a cross between the Doberman Pinscher and the Rottweiler. The best way to determine the temperament of a mixed breed is to look up all breeds in the cross and know you can get any combination of any of the characteristics found in either breed. Not all of these designer hybrid dogs being bred are 50% purebred to 50% purebred. It is very common for breeders to breed multi-generation crosses. 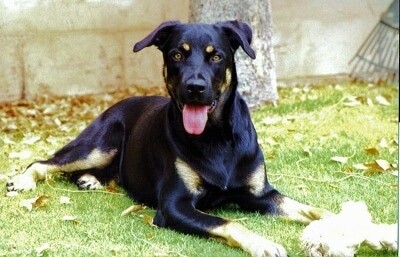 "Pictured is my female Rottweiler / Doberman mix (or Rotterman) Scully at 7 years of age. Scully lives in Tempe, Arizona, and is a professional cat chaser." Roxi the Rottie / Dob mix—her mother is a Doberman Pinscher and her father a Rottweiler. Casper the Rotterman (Rottie / Dob hybrid)—"These are pictures of Casper around the house at about 11 years old. He weighs in between 95-100 pounds. He's about 33 inches tall. He is a wonderful family dog, with a great personality and temperament. Still surprisingly playful at 11 years old."